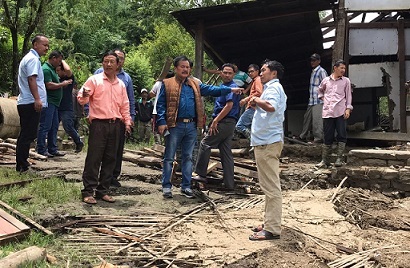 Manipur Tribal Affairs & Hills and Fisheries Minister N Kayisii inspected Thonglang in Kangpokpi district which falls under his constituency Tadubi, to take stock of the situation post the devastating landslide that occurred in the village last week. Minister Kayisii was accompanied by Chairman and ex-chairman of Thonglang Village Council, local Member of District Council, church leaders and villagers during the day’s visit. According to official sources available here, the minister soon after his arrival at the village conducted a spot inspection of the damage caused by the landslide. Interacting with the villagers, he encouraged the villagers to plant more trees to maintain the ecological balance in the area. While extending some relief materials, he assured that CGI sheets would be provided to the affected households. Expressing concern over the poor connectivity in the village, especially the road condition, mobile and power connectivity, Kayisii also assured that the issues would be addressed to bring development in the area. He further expressed that he would put more efforts to bring closer ties with the locals in the coming days. The devastating landslide damaged six dwelling houses including a church building and the office building of Thonglang Youth Club last week. Although there was infrastructural damage caused by the landslide, there was no report of human casualty. The landslide also damaged a stretch of a State highway at Thonglang village – IT Road preventing vehicular movement at the road stretch. Multiple crack lines are clearly visible at a spot on the road. According to villagers, Thonglang village-IT Road is the lifeline for more than 200 villages. With the lifeline being cut off, goods and essential commodities have been transported through Thonglang-Senapati Road by taking a bypass through a steep inter-village road. Incidentally, a culvert and a road stretch along Thonglang-Senapati road were also damaged due to the landslide. Villagers also expressed that constructing a side drain along with a retaining wall may avert landslide to recur.